Global International School, Sivagangai has advertised in the DINAMALAR newspaper for recruitment of Teachers PGT / TGT / KGT jobs vacancies. Interested and eligible job aspirants are requested to walk-in on 02nd and 03 February 2019. Check out further more details below. 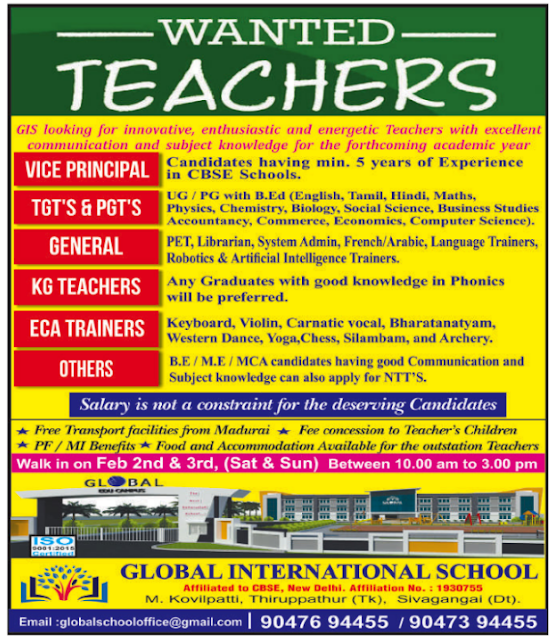 UG / PG with B.Ed for PGT / TGT. For others, please see below. How to Apply: Interested and eligible candidates are requested to attend the Walk-in interview by bringing their CV along with originals & copies of certificates and recent PP size photo to the walk-in address provided below.